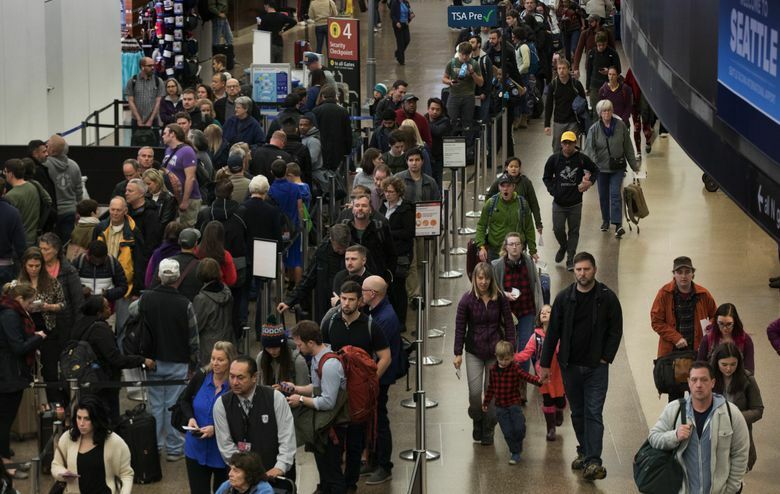 A confluence of spring breaks at local schools has families leaving town, perhaps seeking sunnier skies, and is making parking at Seattle-Tacoma International Airport “extremely challenging,” airport officials warned this week. Their message: Don’t drive to the airport. Consider taking light rail, a shuttle or a taxi or other ride-hailing service. The crunch is affecting both the 13,000-space airport garage and off-site lots. Port of Seattle spokesman Perry Cooper said the airport is experiencing a “crossover of business travelers and leisure travelers” typical in the spring. Because mid-week can be the busiest, parking may start to get easier to find this weekend, Cooper said. Cornell Deloney, a shuttle driver at the Doug Fox parking lot east of the airport, said the lot was full by 10 a.m. Wednesday. Deloney said the crowds of families on spring break and parents visiting kids at college aren’t unusual for this time of year, though the numbers have seemed to increase in the past two years. Sea-Tac has grown fast in recent years, with passenger traffic on the rise as more and larger planes carry more travelers.